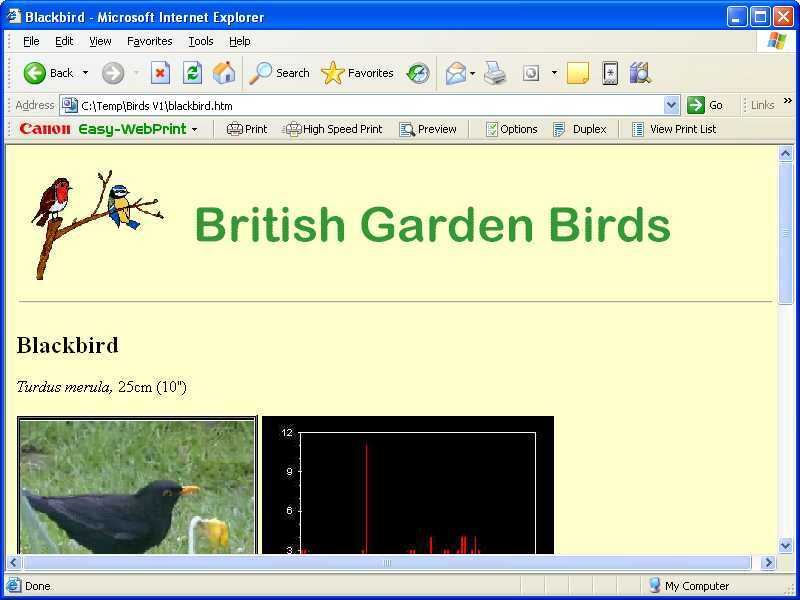 Back in 1998 I decided it was time to learn more about the web publishing, but needed a topic... How about the birds in my garden, after all, I had earlier that year started the BTO Garden Birdwatch survey? The rest, as they say, is history, and the following is a potted history of the site's development. 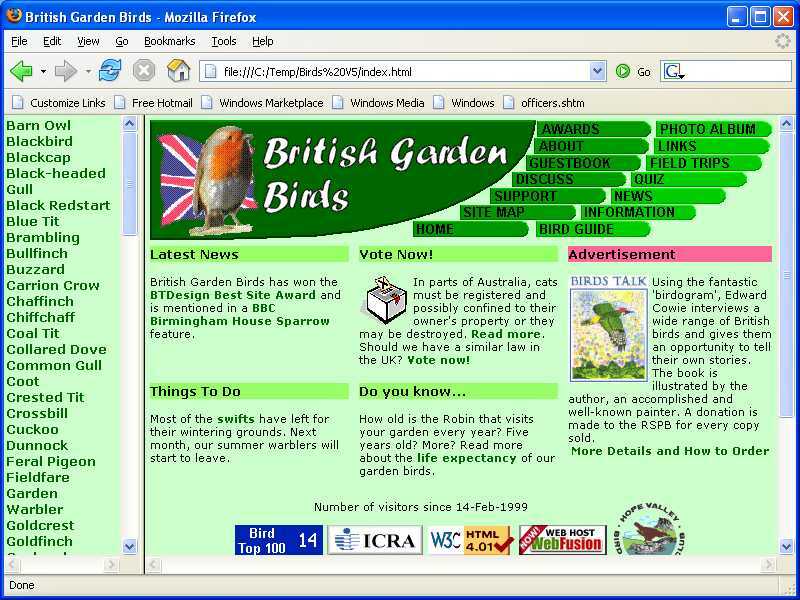 I started learning about web or HTML publishing using Corel WordPerfect, producing pages in the word processor and publishing it in HTML format. The pages were never published on the internet - that was another hurdle - as I was rather unhappy with the appearance. I bought a book called "Teach Yourself HTML Publishing on the World Wide Web" by Mac Bride. This book is, I believe, now out of print but is one of the best "teach yourself" books I've ever read. 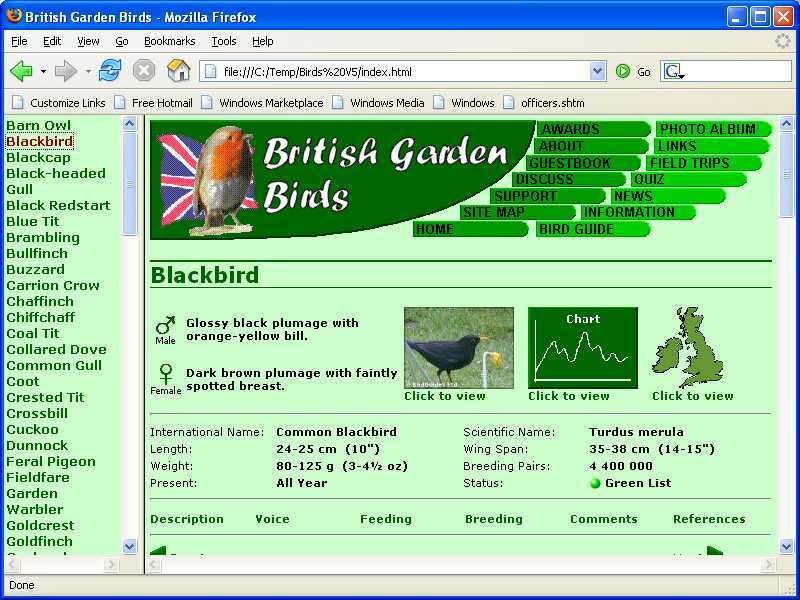 As a control engineer, most of my working life is spent programming computer systems to control machinery, so I was happier when I could start building pages by typing the HTML code and so have complete control over layout, appearance, etc. 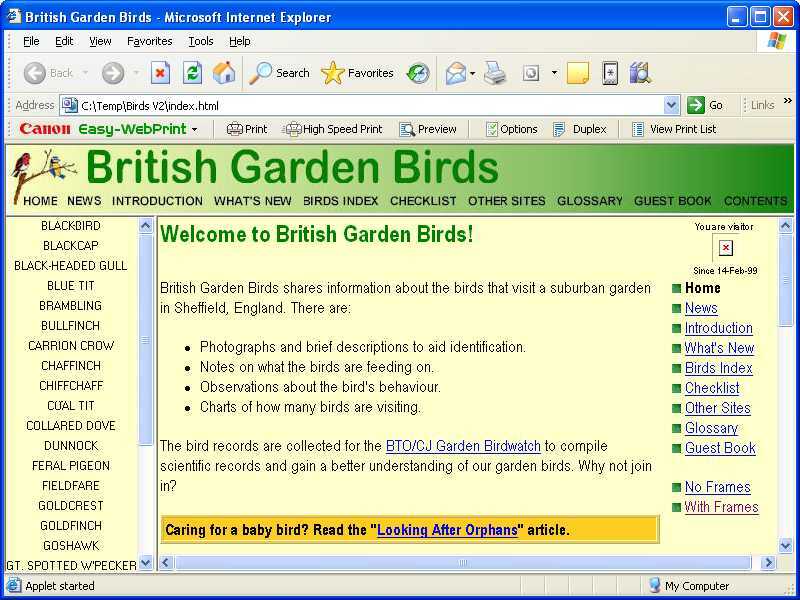 The next step was to figure out how to get the pages on to the internet - quite easy as it happens, upload to the web space provided by your internet service provider using an FTP client - all gobbledegook at the time! 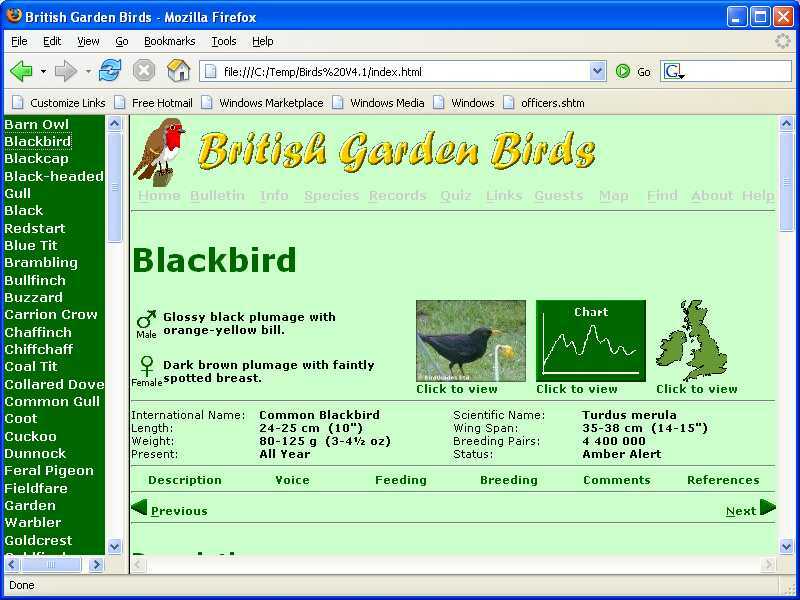 The web site had brief biographies of 44 species, and BirdGuides very kindly granted permission to use pictures from the videos on their CD-ROM. 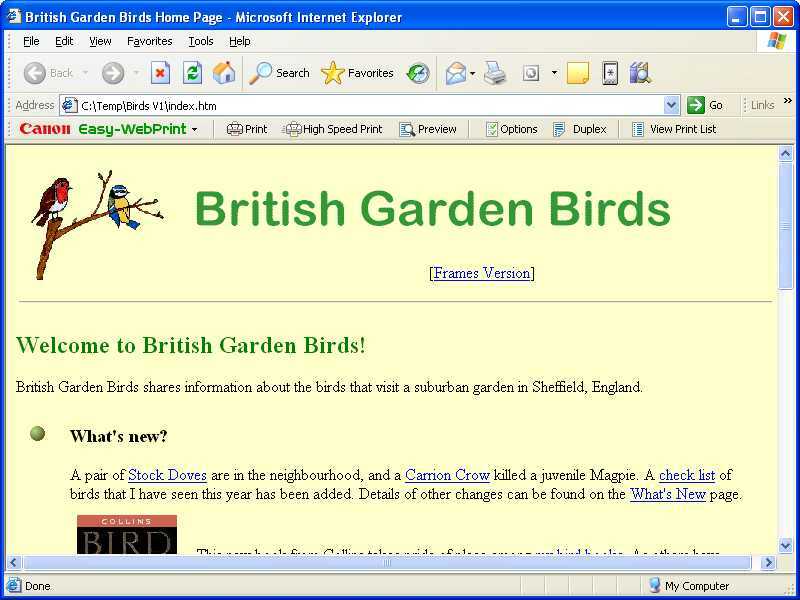 The site was launched on 14 February 1999. 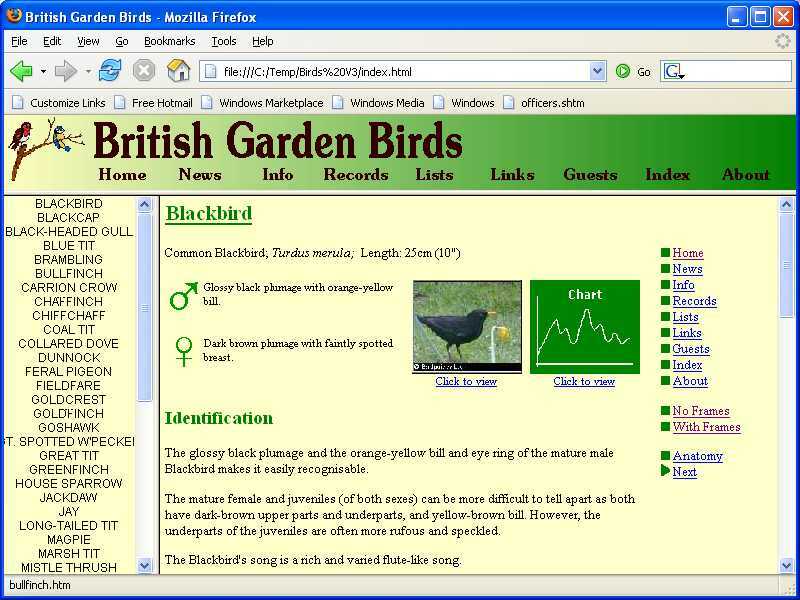 The frameset became a more dominant feature after receiving favourable comments from the site's visitors, which totalled about 30 per week. 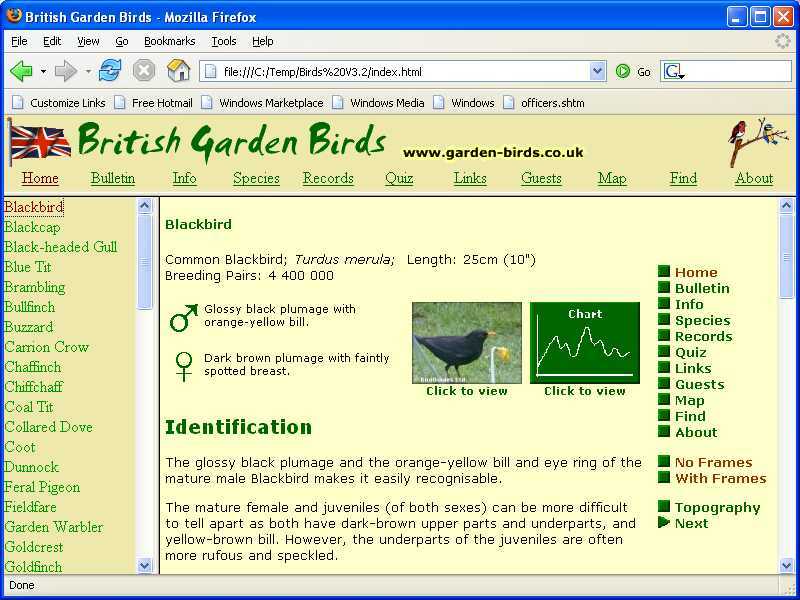 I continued to experiment with various other techniques, such as style sheets, and different layouts, including key identification details for the species. 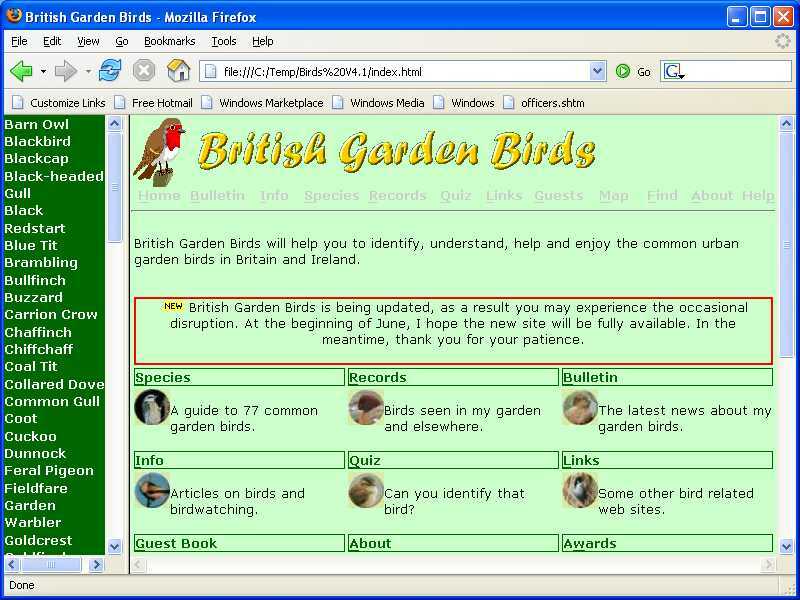 The site was registered with Internet Content Rating Association so that parental controls would allow children to visit the site; a similar service rejected my registration because of certain birds' names! 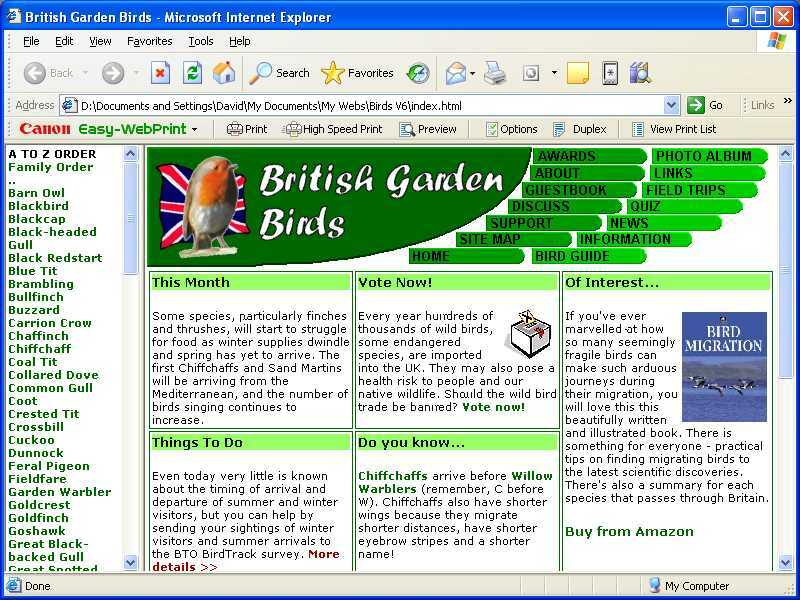 Information about feeding was added to the species' pages. 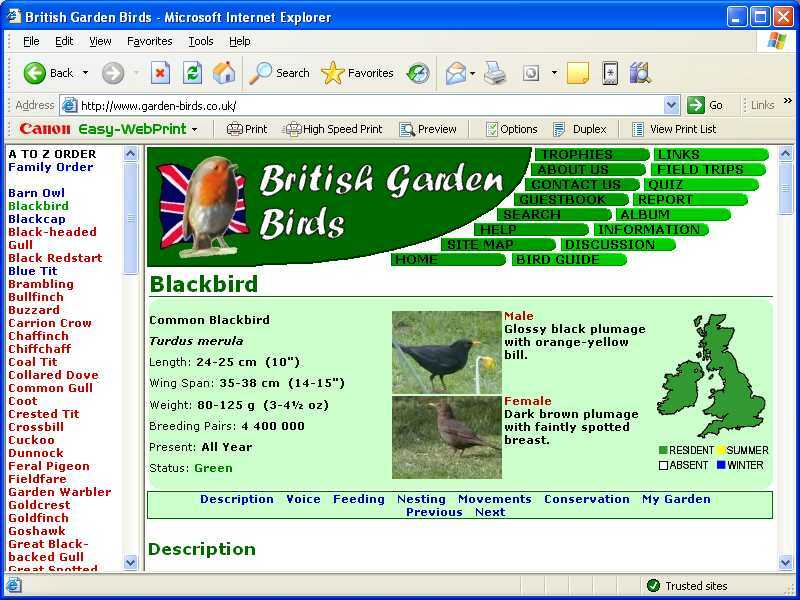 The biggest, long lasting change was the purchase of the domain name www.garden-birds.co.uk, which was used in conjunction with a web forwarding service that redirected people to the BTInternet web space, "www.btinternet.com/~david.gains". This was around December 2000. The web site received a Golden Web Award from the International Association of Web Masters & Designers. 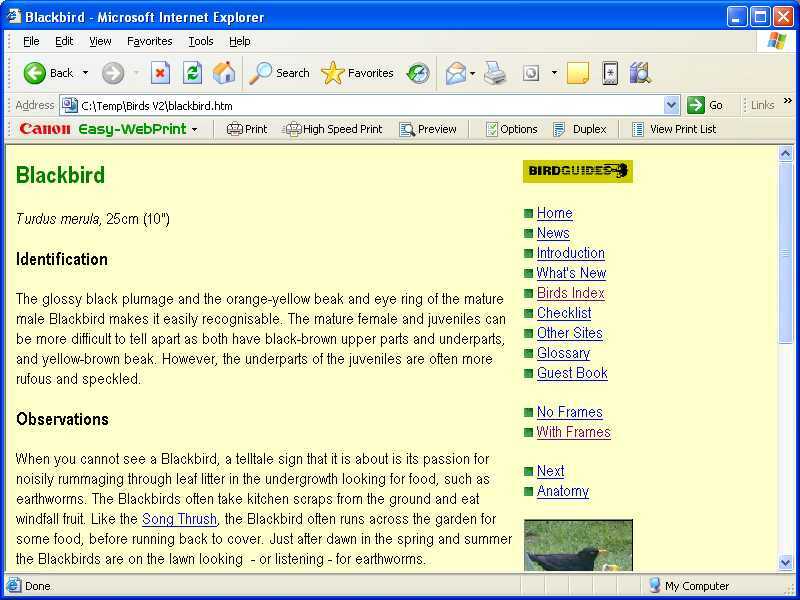 The bird species pages were changed to present key information at a glance at the top of the page and with improved navigation in the page and between species. Distribution maps were added for the first time. 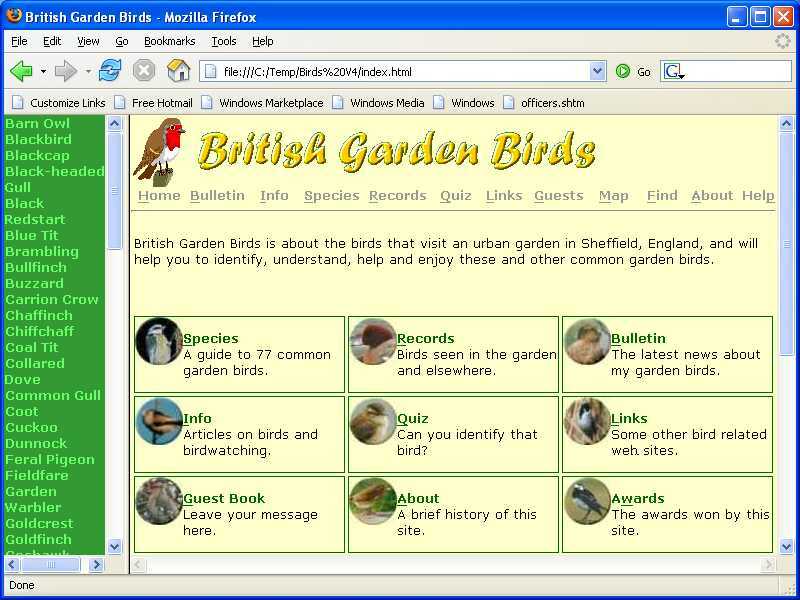 There were now 77 species covered. 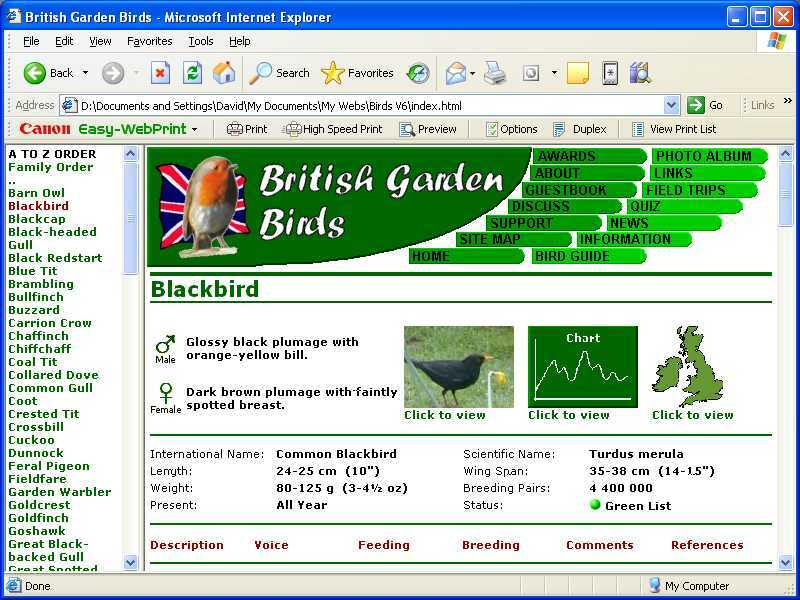 To increase the number of visitors, details were submitted to as many free search engines, such as Yahoo, AltaVista, Lycos, etc., as possible. Evidently, I was happy with green and I remember receiving an e-mail from someone praising the colour scheme, but also one from someone else complaining that it used all their green ink! I also spent a lot of time designing a new logo and navigation bar that provided links using a client-side image map. 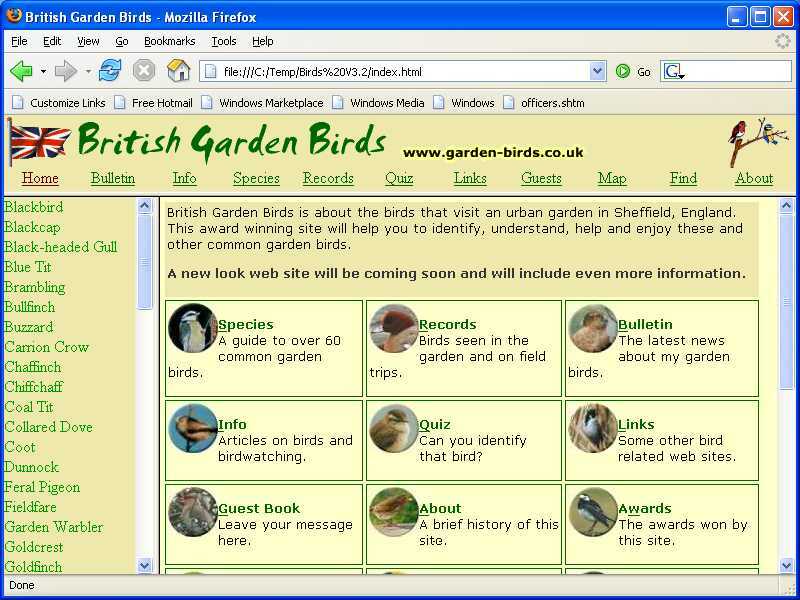 There were now 94 species - I'd asked visitors to let me know of species they wanted adding. 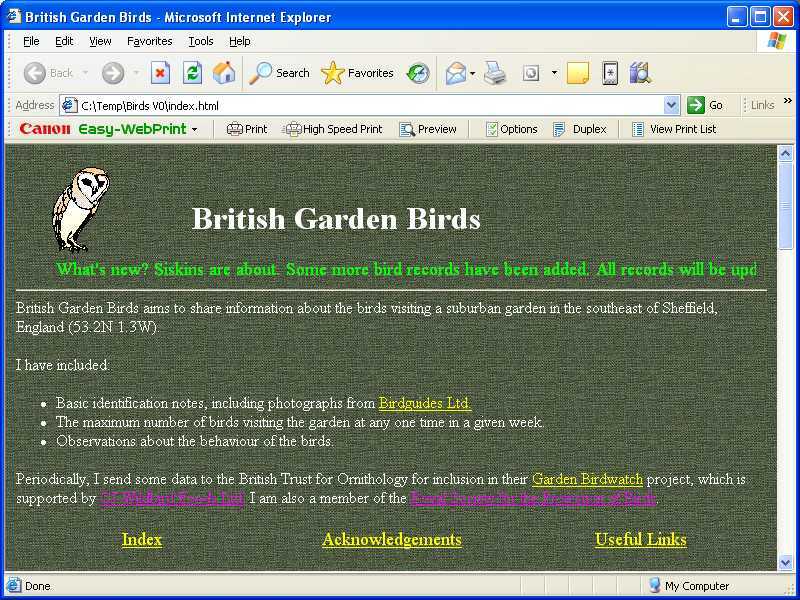 This was also the time (31 March 2002) that both the Discussion Board and Photo Album appeared. By now, I was reasonably happy with the appearance but chose to use a very pale green JPEG tile to improve contrast between words and background to make the text more readable. The number of bird species hit the magic 100 mark! 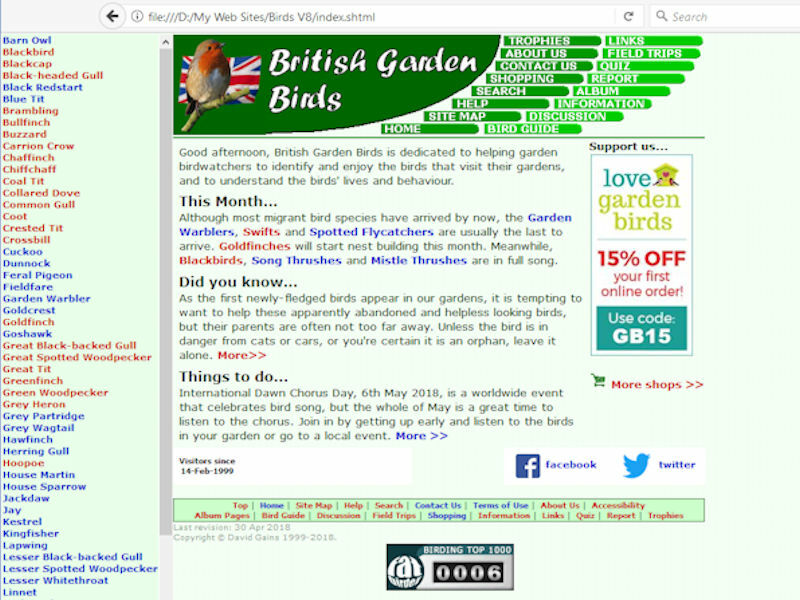 The web site was awarded a BTDesign Award for the high educational quality of both design and content, and was Website of the Month in BBC Gardeners' World magazine (April 2004). 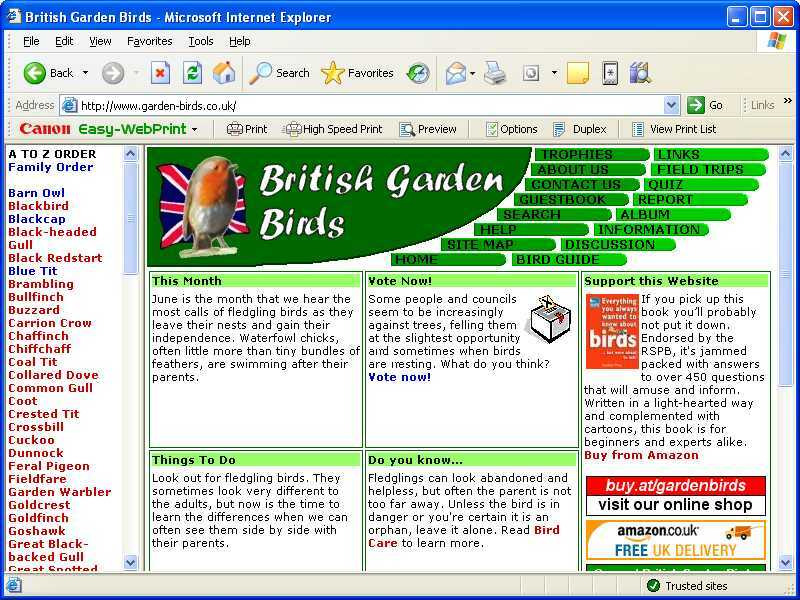 The following is a screenshot from 16 August 2003. 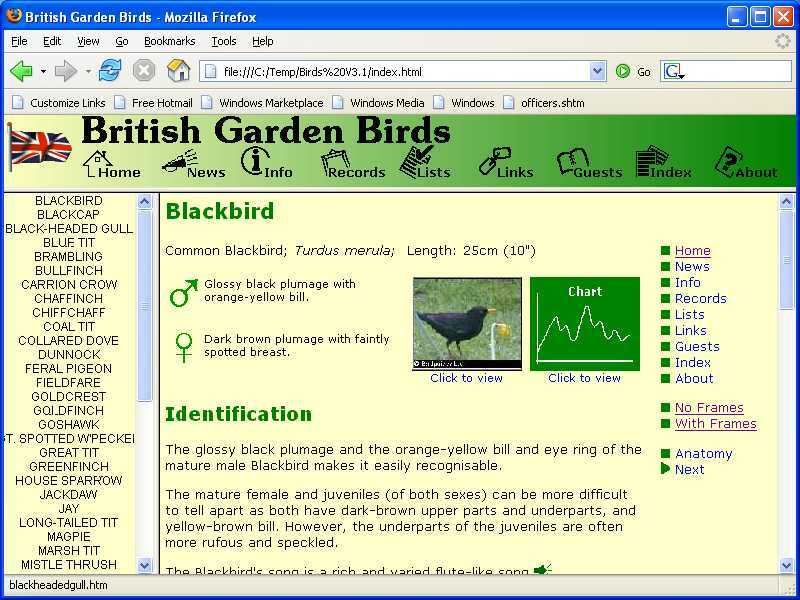 The next incarnation improved accessibility around the site, by providing shortcut keys, and to information by reducing the number of pop-up windows. Standard link colours had been restored. 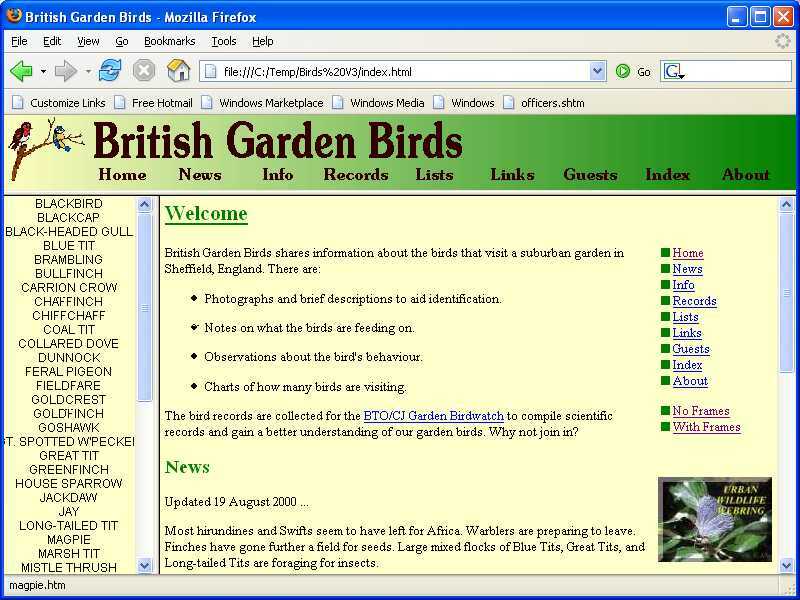 The web site used valid XHTML 1.0 and a more extensive use of cascading style sheets (CSS). 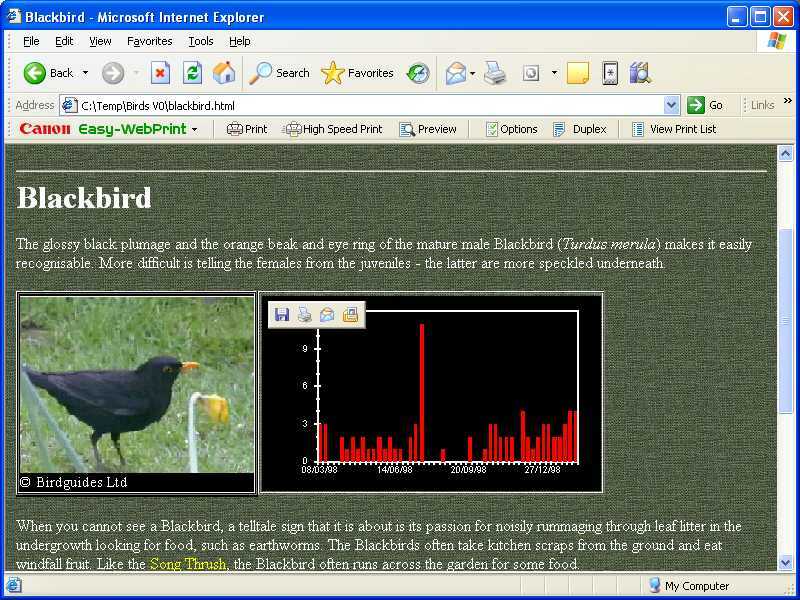 Bird pages included more photos and sound clips, and sections on movements and conservation. The sidebar could be sorted by species, family or size. Field trip lists were reduced in number and the remainder included more details about the reserves, etc. Information pages were updated, removing some where information was available elsewhere. Of course, perhaps the biggest change was the move from a shared hosting service to a virtual private server because of the site's popularity and increased bandwidth requirements. 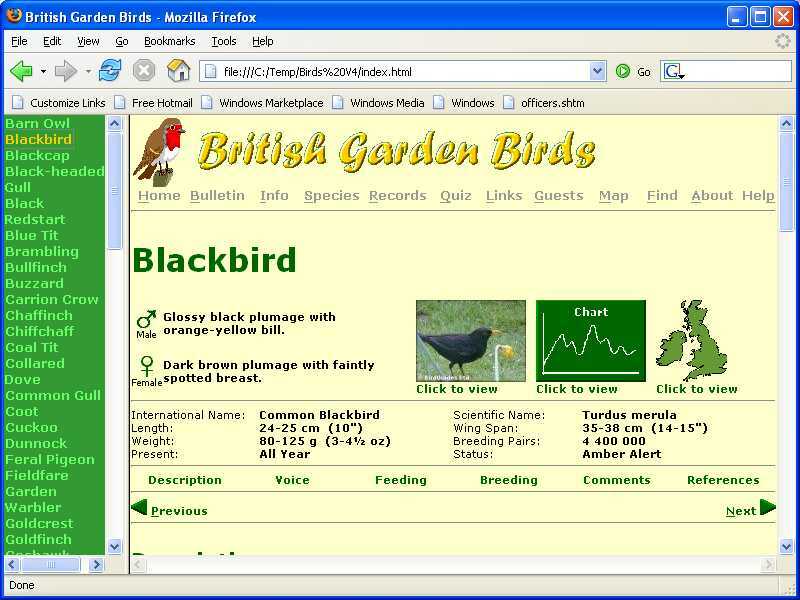 Frames and framesets ceased to be supported in 2014 and so the appearance and most of the functionality of the sidebar had to be replaced using cascading style sheets (CSS).